The Voynich Manuscript is a document that is notable for it's strange text, that to date hasn't been decyphered. It dates to the early 15th century and it is named after the book dealer Wilfrid Michael Voynich, not the writer. I'm surprised that noone has mentioned Voynich manuscripts here on the forum yet. A friend of mine told me about it 4-5 days ago and since than I try to get clues from the illustrations. Some of the illustrations I thought were astrological, might as well be the optimum times for plant harvesting days -like an agricultural calendar. Some of the illustrations look like towers, but they might be sketches of telescopes. Some look like galaxies, but might be microscobic drawings. I don't know what the naked women bathing represent either, birth/death circles, chromosomes, herbal spring baths? Fascinating stuff O, never heard of them but it strikes an interest here so thanks for the thread. There are Voynich's in the portrait gallery and others who look to be researchers and medieval personalities. An unknown language where experts have only been able to decipher 14 characters, a lost culture? The sun (if that's what it is) has been represented with multiple beam output. Yes the Voynich Manuscript is very intriguing and shrouded in mystery. Terence McKenna was also interested in this manuscript and discussed it if anyone is interested. 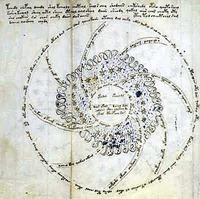 Some interesting information on the Voynich Manuscript. A Jewish bookseller by the name of H. P. Kraus purchased the manuscript in 1961 for $24,500, and after being unable to sell it donated it to the Beinecke Rare Book and Manuscript Library at Yale University in 1969. An interesting note about the library, students and faculty are indeed allowed to look at and handle most of the materials. The Voynich Manuscript is off limits however, being rather fragile. Also, I'd like to add, if you do not feel like reading the page I linked to, this quote from Roger Bacon (emphasis is my own), the believed author of the manuscript. "The man is insane who writes a secret in any other way than one which will conceal it from the vulgar and make it intelligible only with difficulty even to scientific men and earnest students. On this point the entire body of scientific men have been agreed from the outset, and by many methods have concealed from the vulgar all secrets of science. For some have concealed many things by magic figures and spells, others by mysterious and symbolic words." This secrecy is what humanity as a whole has been affected by since the fall of Atlantis. Enough is enough!